In recent years, it has become increasingly popular for facilities to install commercial-grade espresso machines to serve their guests. From churches to exposition halls to hotel lobbies, it’s clear that the caffeine craze has expanded beyond the confines of the neighborhood coffee shops. Espresso machines (and the coffee stands that host them) are an excellent addition to any facility and, from your guests’ point of view, can add value to your location. Depending on how busy your machine stays, however, it may be difficult to keep in tip-top shape. Here are 4 cleaning suggestions to keep your espresso machine gleaming and producing great coffee for years to come. 1. Do a thorough – but quick – cleaning of all surface areas daily after closing. Experts across the field agree that a daily cleaning doesn’t need to take more than 10 to 20 minutes, but that it should be thorough. Keep the stainless steel on your machine gleaming by wiping down the front and sides daily with a soft cloth and a simple all-purpose cleaner, such as our All Purpose Neutral Cleaner. Not only will keeping a clean exterior help keep your machine in good working order, it will also appeal more to your guests. Machines littered with water marks, oils, and other stains seem uninviting to customers. Keeping your machine shiny will attract more visitors. 2. Soak removable parts in warm water with your chosen brand of commercial espresso machine cleaner. It’s easy to soak your handles, shower screens, and baskets while you’re cleaning other areas of the espresso bar. To prepare the soaking liquid, fill a bucket or sink with hot water and add a teaspoon of your preferred brand of espresso machine cleaning solution. Carefully add the pieces you’ve removed from the machine and let them sit while you clean up in other areas. Before replacing the parts, give them a good rinse in warm water. Soaking these items will keep your machine running without problems in the future. 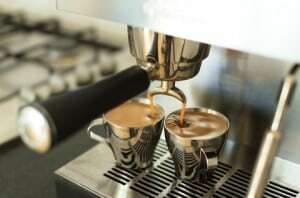 It will also ensure that the oils from the espresso beans will not build up and, ultimately, affect the taste of your coffee or later ruin the productivity of your machine. Some prefer to soak their parts overnight, which is an equally fine practice. Should your location choose to soak overnight, just be sure to give the pieces a good rinse before replacing them to ensure the cleaning solution is completely washed out. 3. Give special attention to the steam wands on a daily basis. The steam wands are, arguably, one of the most used parts of your machine. Be sure to carefully wipe the steam wands to remove any steamed milk residue remaining from the day. Never use anything sharp to pick at the wands, as you could seriously damage or scratch them. If the nozzle ends are removable, take them off and clean them separately with warm, sudsy water. 4. Backflush your machine at the end of every day. If your location is churning out more than 50 espresso drinks in a single day, back flushing your machine daily after closing time will prolong its life and ensure that you provide your guests with quality coffee. To start a backflush process, first use a flathead screwdriver to pop off the baskets from your handles and replace them with “blind baskets” that don’t have any holes. Add a teaspoon of your preferred espresso machine cleaning solution and replace the handle on the machine. Be sure to get the handles locked in tightly, as there will be a significant amount of pressure buildup. Next, remove your drip tray cover so you’re able to see what comes out of your machine. There isn’t usually anything to be concerned about, but you should always keep an eye on the flushed liquid. Finally, use the manual buttons to begin the flush. Hold down the buttons to turn on the pump for about 5 seconds, and then release them to turn it off. You’ll see the liquid flush into your drip tray. Wait about 30 seconds and repeat the process. Continue the flush-and-wait procedure 5 to 10 times, depending on the size of your machine. Check your user manual for more specific instructions. When you’ve completed the flush, let the machine sit for about 10 to 15 minutes. Remove the handles again and clear them of any detergent by rinsing them thoroughly. Repeat the backflush process a few more times, detergent-free, to ensure all the grime and soap has been removed from your machine. By following these 4 tips, you’ll ensure that your espresso machine will be in beautiful working order over the course of its life expectancy. These few simple steps will keep your customers coming back for their caffeine fix. This entry was posted in Food Service and tagged All-Purpose Neutral Cleaner. Bookmark the permalink. I like your tip to soak the removable parts while you clean the rest of the machine. Sometimes I tend to just clean them on the machine to save time but I can see how this would be more effective. I like the idea of soaking them overnight So they can get as clean as possible. Do they need to be dried completely before I put them back on?